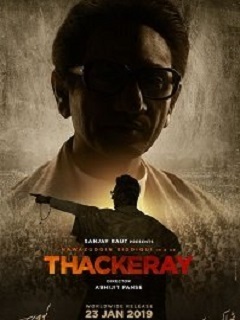 Thackeray is a political biopic on life & times of a towering political leader of India, Shivsena supremo Shri. Balasaheb Thackeray. Making the film on Balasaheb Thackeray is not an easy task, said Uddhav Thackeray. ‘Thackrey’ would be released on January 23, 2019, in Hindi and Marathi language. ‘Thackrey’ is being directed by Abhijit Panse and written by Sanjay Raut. Amitabh suggested to makers of ‘Thackeray’ to make a series on Bal Thackeray instead of making a single film. Megastar Amitabh Bachchan promises to give his contribution in the upcoming biopic titled ‘Thackeray’.